You control the helicopter, altering its elevation and speed with the mouse. Suspended from its base is a stick-figure man -- a stunt man -- who, at the click of the mouse, will attempt a death defying stunt that involves hurtling towards the ground without a parachute or any safety measure whatsoever. 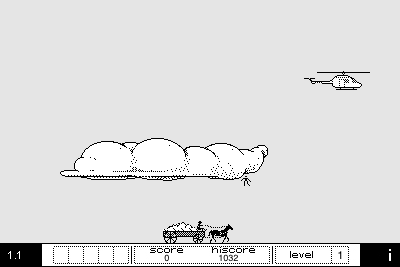 A simple horse-drawn wagon travels across the bottom of the screen. Land in the hay-stack at the back of the wagon for a thumbs up and a score relative to the distance dropped. Miss the wagon and you get a thumbs down; your score is unchanged. There are five drops per level. Make them all to advance to the next level, which is slightly more difficult. Fail and you have to start again. That's it…sort of. 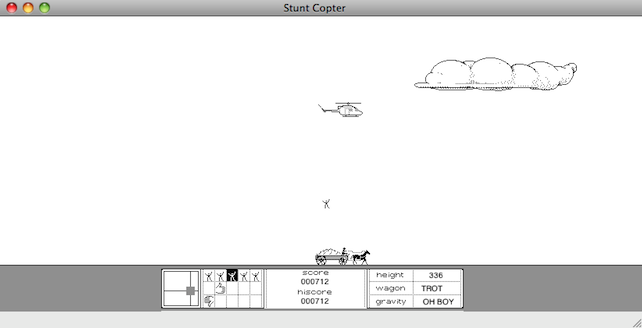 There is a certain humour inherent in failing the game that makes StuntCopter more than the sum of its parts. If you drop your stuntman on the horse, it will topple over and you'll instantly lose. Likewise, the driver of the wagon can be taken out with a well-timed drop. It became a legendary meta-game -- the aim being to take them out from as high as possible, with bonus points for falling through the cloud. No version of StuntCopter ever rewarded you for doing this (beyond the tiny-yet-entertaining animation and painful-grunt sound effect). But that didn't stop anyone. Through simple animation and crude drawing, the game imbues the stunt man with astounding personality. His arms and legs flail around wildly as he falls, like he's just an ordinary guy in an extraordinary situation. 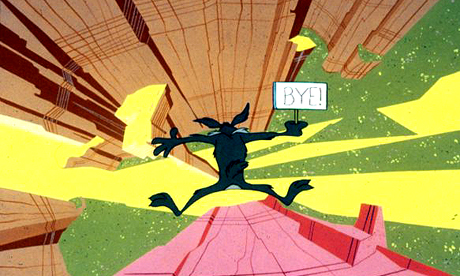 The cartooniness of the presentation keeps things from getting disturbing, as each of the different fail-states is akin to the violently-comic failures of Wile E. Coyote in Looney Tunes. How StuntCopter manages to grasp the humour of cartoon violence with such limited resources is beyond me, but somehow I find it just as amusing as when I first played the game almost 20 years ago. The iPhone port (found here) stays true to the original, with the same sound samples and graphics, in addition to a very similar feel. 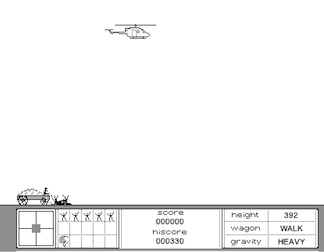 You control the helicopter by tilting, and drop the stuntman by tapping on the screen. It all feels quite natural, although is a bit fidgety compared to the mouse controls of the classic Mac version. 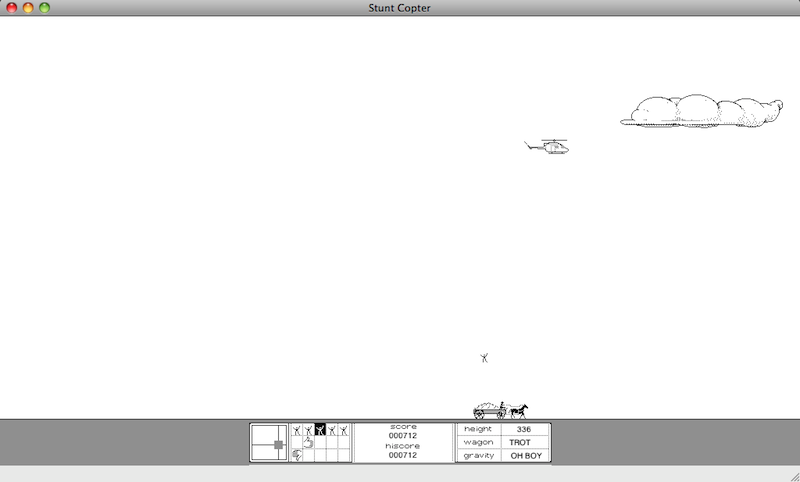 The wrapping of the helicopter around the screen is gone, as are portions of the interface that tell of the wagon's current speed (e.g. walk, trot, gallop), the gravitational pull (which decreases as the level goes up), and the current height above ground. Also gone is the back-flip animation that would play with every successful drop. It's debatable whether these modifications in the presentation take anything away from the experience, as the game benefits from the streamlining on the small screen, but misses some of the little touches that made the original game special. For better or worse, the iPhone version is more forgiving than the original, with no requirement to manage five successful drops until you reach the higher levels, and what feels like a more subtle change in difficulty from one level to the next. StuntCopter is a game perfectly suited to playing on the go or in between tasks -- each play is likely to last a few minutes at most, and is immediately gratifying. There's not much depth, but there doesn't need to be, because the biggest draw is its simple elegance. It begs the question of what might have been were Blehm still alive today -- the kid clearly had a knack for finding the fun in a very basic concept, with severely limited resources.